This week I am back at it with my SQLCoOp friends in sharing something new that we’ve learned since our last post. You ready? Great, pull up a chair and let’s see where this takes us shall we? Wait a second…….do you hear that……..no, listen closer…….ALERT ALERT ALERT! Sirens seem to be going off all around and somehow we found ourselves in all hands on deck mode. Have you ever been there before? Chances are if you have worked in technology at all this has happened to you at one point in your career. If it hasn’t then eventually it will; trust me. How do you handle such scenarios when they do come up? 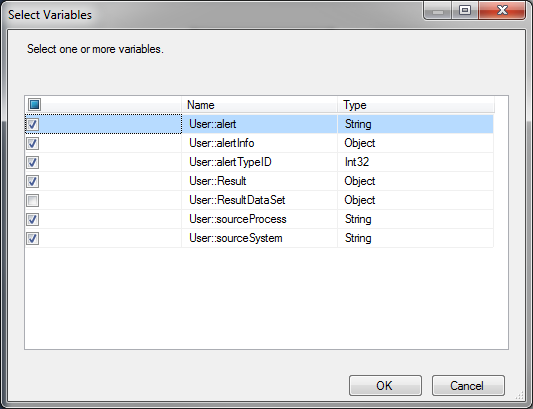 Reporting of alerts off your systems or applications can be very useful and while there are many ways to accomplish this I was introduced to an SSIS method I had to deploy this week. It made me dive in a little deeper and look into how the methodology behind it. If we break it down; it can be done so my analyzing 4 steps within the package. The main package will consist of a database call, a for each loop container, setting of a variables task, then a wsdl (windows service) by utilizing an expression. The intent of this post is to show how you can make these calls happen and not to go into depth of what is located within the procedures or wsdl file; that shall be something for another today or better yet this should set a foundation in place for additional research one can do…..thus the learning something new part. 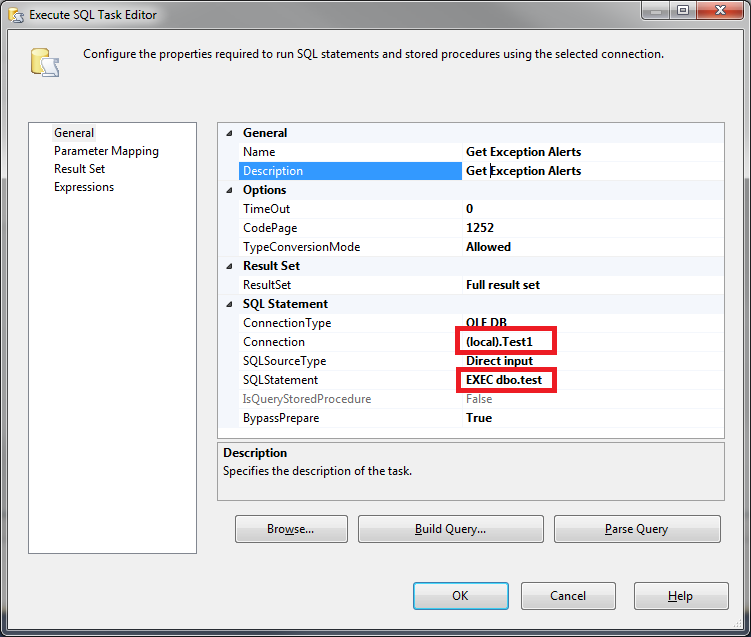 The Get Exceptions Alert utilized a simple SQL Task editor; once you create this editor you will notice the below screen shot. To complete the set up simply fill in the name and description. The next two important properties are the most important of them all. The connection and the SQL Statement. The connection is simply the database to which you are making the connection to; the second is executing a stored procedure that will gather all the alerts by the application that need to be emailed out. One of the key components are the variables to which you will utilize. These may be different depending on the in depth alerting that is wanting to be accomplished but for simplicity sake I will list out what the one I ran across was utilizing. We will notice that we have seven variables that will be set. Registering the alert and sending the email notification is the last step to the puzzle. 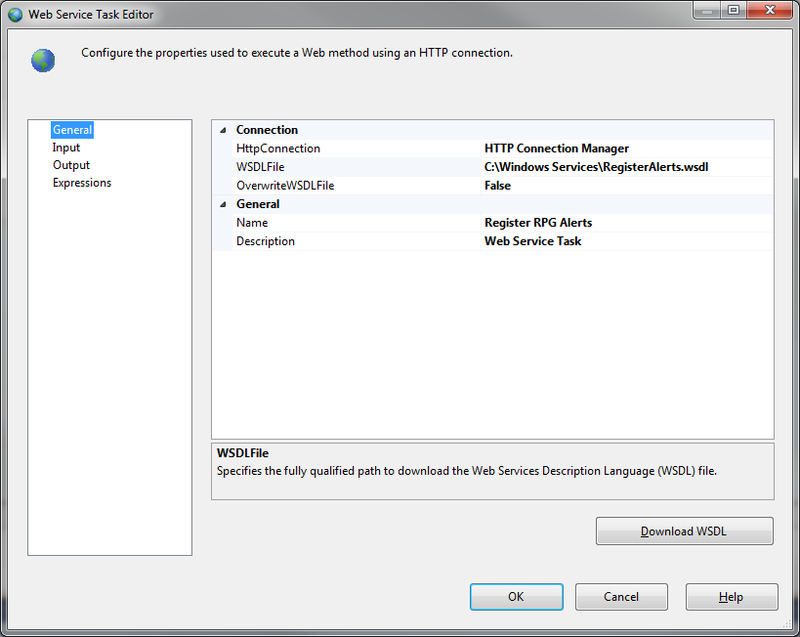 This is done by utilizing the windows task service editor within SSIS. As you can see I have a wsdl file located on my local drive in a directory called Windows Services. As I mentioned before, I will not be going into detail of the contents of the wsdl file; simply know that it will trigger the email notification. The result parameter will be fired off to a group of individuals to review on a time based period. 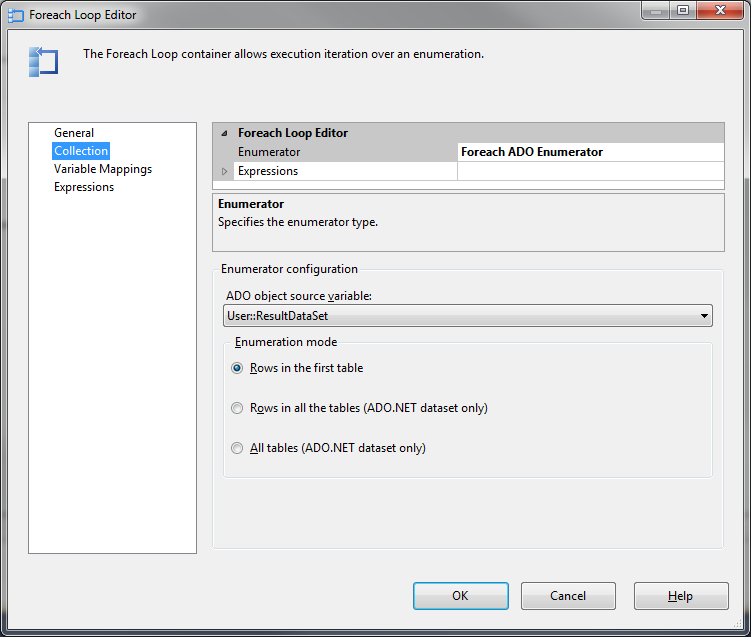 That parameter value will be supplied in the output section of the Web Service Task editor. There are several ways to arrive at this same goal and I found this one to be unique and one that is not traveled often. The package can be set up to be executed by the Agent on a time based interval. Whatever the case may be and whatever method that you do choose the important part is to keep learning. This entry was posted in Uncategorized and tagged #SQLCoOp, SQLServer by Chris Yates. Bookmark the permalink.